This origami shamrock can be made with 3 or 4 leaves so can double up as a four-leaf clover for good luck! 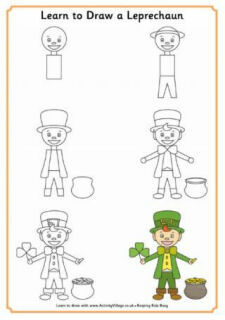 This paper plate shamrock makes a satisfying kids craft for St Patrick's Day, with painting, cutting and sticking involved! This Pot of Gold craft makes a perfect decoration for St Patricks day, especially if you fill it to overflowing with chocolate coins! This St Patrick's Day sun catcher craft looks so pretty hanging in front of the window! Here is a pretty craft idea for a St Patrick's Day Wreath that your children will enjoy making. Great for Rainbows too.